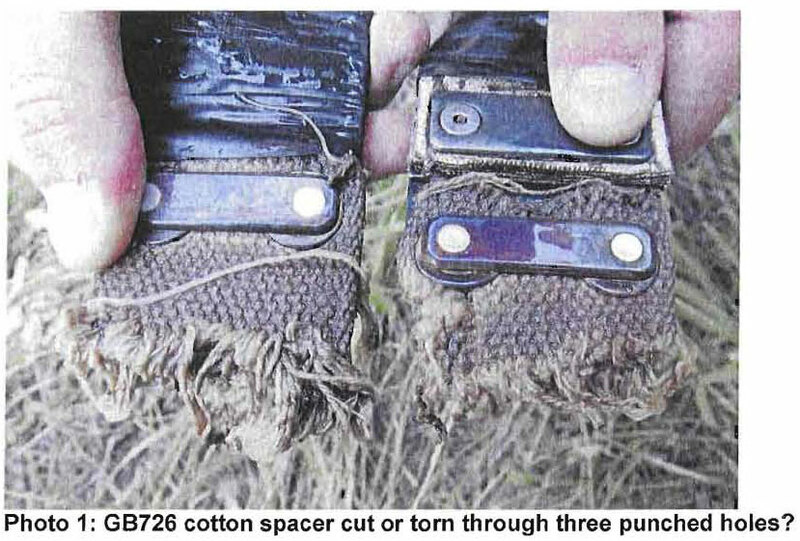 The collar of Grizzly #726, emitting a mortality signal, was detected during a routine flight on September 12, 2012. The collar hadn’t moved for a while so the mercury switch that tells the collar that the bear is still alive hadn’t been triggered, thus increasing the frequency of the beeps heard from the telemetry monitor. That prompted the investigators from Montana FWP to go to the location on the East Fork of Spring Creek on the Agricultural Research Service’s US Sheep Experiment Station (USSES). The bear, a 3 to 4 year old, 392 pound, male, had been collared just a few weeks before on Sawtell Peak in Idaho and was roaming around the Centennial Mountains on the border between Idaho and Montana to the west of Yellowstone National Park along the Continental Divide. It had last been seen by biologists on August 30 – 31st, 2012 on the West Fork of Spring Creek during the previous monitoring flight. 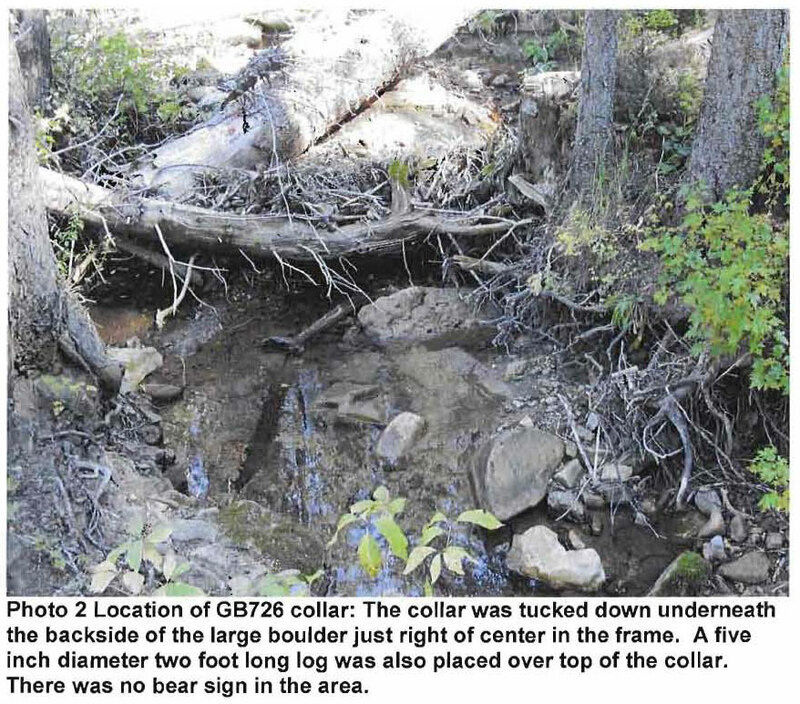 When Craig Whitman and Nick Miles, the USGS-Grizzly Bear Study Team biologists sent to investigate, arrived at the location on September 17, they found the collar stuffed under a log in the creek but they didn’t find evidence of the bear. The collar had obviously been cut and then placed in the creek. Next to the creek was a hunting camp and they found at least three sets of footprints that they photographed. They also spoke to two hunters from Wisconsin who were visibly nervous once they were asked about the radio collar but they denied any knowledge of the radio collar. Later, because the hunters were able to show that they hadn’t arrived at the site until the 14th, and the collar was first located in mortality mode on the 12th, the hunters were no longer considered suspects. The remaining set of footprints could not be explained. You can read the investigator reports here. On September 26, investigators took a trained dog to the site where the bear was last seen alive. When investigating the site they noticed that it was right in the middle of where a USSES sheep herder had been stationed around the end of August with a large band of sheep. Upon further search they discovered a single shell casing that was laying on top of dead grass, indicating it had been fired in the recent past, but still did not find any sign of the bear. Fast forward to March 17, 2013 when a letter to the editor appears in the Montana Standard from the retired Dillon Field Office manager of the BLM, Tim Bozorth. It’s pretty obvious that the federal government’s sheep grazing in the Centennial Mountains along the Montana Idaho border killed grizzly bear #726. In this area of Montana and Idaho there is no hunting season in late August and September, so hunters are not to blame. Only the U.S. government sheep herder was known to be in the area when the bear disappeared, hum. Bozorth isn’t a new critic of the USSES. When he was still the Manager of the Dillon Field Office he also wrote a letter recommending that the ARS close the East and West Summer Pastures that sprawl across a big portion of the Montana side of the Centennial Mountains. He cited the fact that the area is occupied grizzly habitat and a critical corridor for grizzly dispersal to the west as well as a critical corridor between central Idaho and the Greater Yellowstone Ecosystem for many other species ranging from wolves to wolverines. Bozorth also sat on the Yellowstone Ecosystem Subcommittee (YES) and encouraged them to recommend the closure of these pastures as well. All of this comes at a time when a court mandated NEPA process has stalled. A process to evaluate the USSES started in April, 2009. That year the sheep station conducted an Environmental Assessment that determined that there were significant impacts caused by their activities which required a more intensive Environmental Impact Statement. By agreement between litigants and the USSES, a decision was supposed to be made by March of 2012. Presumably the stall in decision making is due, in part, to closure of the Bernice allotment to sheep grazing by the BLM last year. 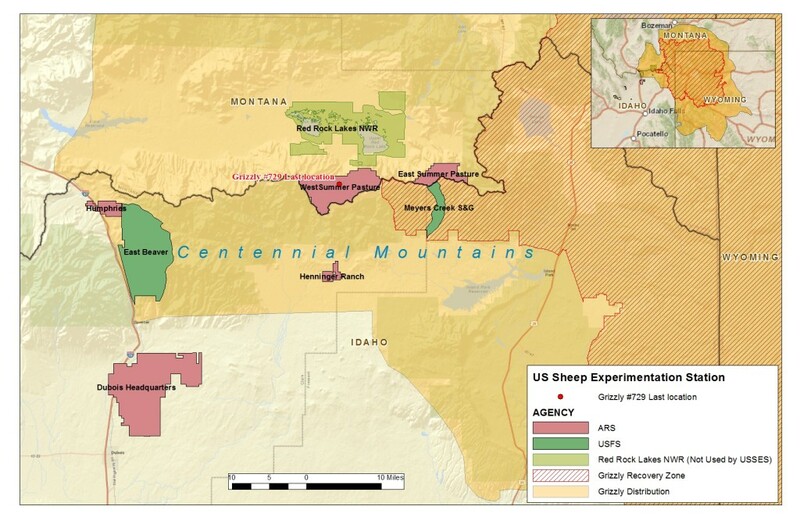 This allotment was analyzed in the Draft Environmental Impact Statement and was being grazed each year by the USSES but the BLM closed it to sheep grazing due to the threat that sheep posed to bighorn sheep. There has been no alternative pasture found to replace this one. The stall could also be due to the concerns raised by several other agencies about the impacts of USSES activities on grizzlies and bighorn sheep in the Centennial Mountains. See previous articles by The Wildlife News here. Interesting, Ken. I think the gov’t needs to take a much closer look at who their employees *really* are. I’m wondering why the federal gov’t is running a sheep station…what is the purpose? In this case I think that the employee was probably a migrant worker here on the H2A visa program. When on a range tour several years ago the field manager said that they preferred Chilean herders. Sir, I don’t mean to be a nag or go prodding around, however I am also curious as Gail is as to why the government is operating a sheep experimentation station? Is this kind of a like the waterfowl production area that I see south of Pocatello? From my perspective though, they perpetuate an industry that doesn’t belong on public lands and cause a lot of trouble for native wildlife at the same time. The bear was no doubt mistaken for a coyote. I’m impressed with the biologists that first documented the collar stuffed in the creek. They did a superb job of detailing information. Their work exceeded that which would often be short-changed by full-time law enforcement types. No matter how you look at it, things don’t look good (and never did, once the white man moved in 🙂 for predators trying to re-establish old territories, in what’s left of wilderness areas. The Sheep Experiment Station is really a relic-subsidy program of a previous generation that continues to hang on as a consequence of the Livestock Industry’s political pull. My understanding is that the program was originally established, and continues to operate, for the purpose of providing study about efficient sheep production in the West. I assume this involves field study of efficient lamb and wool production given the forage resources available in the arid and semi-arid sage-steppe landscapes available on public lands in the west. Study regarding herding management techniques to maximize weight, minimize loss to the elements/poisonous plants, etc. Breeding and field testing animals to maximize weight, wool production, lambing, general resilience, etc. given this particular environment, etc. In either event, when Ken Cole and I initially visited the station as a consequence of a court settlement (the station would not allow public oversight absent judicial intervention) I believe it safe to say that the both of us were struck by the secrecy of the sheep station’s operation, particularly given it is funded by tax-payers and operated via a public agency. We were told that Sheep Station lands are not “public” lands, they are “federal” lands – thus, our movements/monitoring within the property were precluded/restricted to following station employees closely. It was clear to me that the operation of the sheep station was expressly held to serve the interests of the private livestock industry, as opposed to – what I personally would hope to see – namely, conducting scientific inquiry into the effect of sheep grazing on public interest values: water, wildlife, the environment, predator interactions, etc. etc. etc. The Sheep Station has been able to hang on for as long as it has given the makeup of the respective appropriations committees in the House and Senate being disproportionately stocked with western big hat representatives, who ensure its budget year after year as a kick-back to the powerful Woolgrower private-interests. Thanks for the in depth response. It is interesting to get that kind of perspective. It’s funny that these “federal” lands have the same kind of jurisdiction as an army base, for example. If they’re not doing anything illegal, what is there to hide? Oh well, thanks again. kill wildlife, as Wildlife Services does ALL of the time. Thge University of Idaho “owns” the sheep at the Dubois sheep experimnent station in a shell game that allows the university to claim and receive federal subsidies for lamb meat and wool. I would like to know if they withhold taxes and social security when they pay their Peruvian herders. They also get to graze their sheep on public lands without paying the $1.35 AUM grazing fees. The station needs to be closed!!!!! SAWTELL MT. THIS BEAR COULD NOT HAVE BEEN MISTAKEN FOR A COYOTE. THE VERY IDEA IS SILLY. A CLAIM THAT ALLOWS THE UNIVERSITY OF IDAHO TO RECEIVE FEDERAL SUBSIDIES FOR LAMB MEAN AND WOOL SOUNDS LIKE ANOTHER NOT AT ALL TRANSPARENT PROJECT. THERE IS FAR AND AWAY TOO MUCH FRAUD GOING ON WHERE FED. GOV. FUNDS ARE CONCERNED. I HOPE THOSE “IN THE KNOW” LOOK INTO THIS MATTER AND THAT OF GRAZING FEES UNPAID? SUBMIT CREDIBLE DOCUMENTATION THAT THE ACCUSATION IS WELL FOUNDED AND IF SO CLOSE THIS STATION AND GET THE UNIVERSITY OF IDAHO OUT OF THE RIP OFF SCHEME. The comment about mistaking it for a coyote was a joke about how so many wolves get killed by people who claim to have mistaken it for a coyote. I just got this Ken our government over the past twenty years or so has been getting more corrupt by the day, just seems their are so few in congress that are working for the common man anymore. We can’t even enjoy our wildlife, without some politician using our tax dollars for their own pockets. Makes me totally disgusted.